They say that “a picture is worth a thousand words” and I say that this photo proves that point. 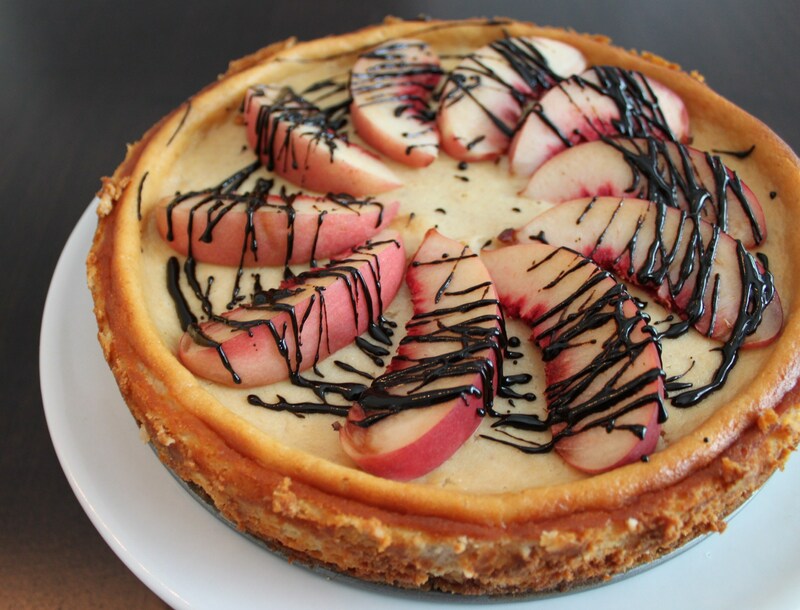 I don’t have much to say about this cheesecake recipe except for you should make it. It seems that the recipes that I question most these days are the ones that are most surprisingly delicious. I was nervous about the use of balsamic vinegar on a cheesecake but I took it to the next level by using 25 year aged balsamic vinegar and reducing it until it was almost candy-like. To save a couple of bones, I replaced 16 ounces of the mascarpone cheese with cream cheese. With peaches in season, you really have no excuse. Before I wrap up this week’s posts, I’ll make a final plea for help by voting for Mod Meals on Mendenhall as Best Local Blog in the GoTriad Readers Choice Awards. Why should a food blog be given this credit? Because I believe MMoM is about more than food. With a passion for cooking fresh, simple and local food, MMoM has aimed to highlight the latest cooking and entertaining trends but also leverage dialogue about local nonprofits doing good work in our community. I’ve highlighted the efforts of many organizations including Triad Health Project, Elsewhere Artist Collaborative, the Guilford Education Alliance, Center City Park, Guilford Green Foundation, the Greensboro Curb Market, the Greensboro Children’s Museum and the Women’s Resource Center. MMoM isn’t a platform for complaints, rants and personal politics. It aims to bring people together, attempts to build community and does this by promoting a common ground we all share – food! You may be asking yourself what I’ll get out of this. A paper certificate that I’ll store away and the feeling of satisfaction and support from readers, like you. Vote here! Preheat oven to 350°F. Blend graham cracker pieces, sugar, and butter in processor until moist clumps form. Press onto bottom (not sides) of 9-inch-diameter springform pan. Bake until golden brown, about 12 minutes. Transfer crust to rack to cool. Maintain oven temperature. Using electric mixer, beat mascarpone, sugar, and flour in large bowl until blended. Beat in eggs 1 at a time; add vanilla extract. Puree diced peaches in mini processor or blender until smooth. Beat peach puree into batter. Pour filling into crust. Bake until edges are raised and dry and center is softly set, about 1 hour 5 minutes. Place hot cheesecake directly in refrigerator. Chill uncovered overnight. Boil balsamic vinegar in small saucepan until reduced to 1/4 cup, about 4 minutes; cool syrup. Cut around cheesecake; remove pan sides. Top with peach slices, drizzle with balsamic vinegar syrup, and serve. oh yum. i know this is my standard reply. but wow. and you have my vote, my friend. well done, all around. thanks for all your support HH! That’s such a gorgeous photo!